Second round? Never heard of it. 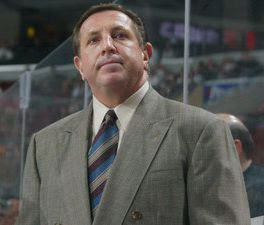 The Montreal Canadiens have named Jacques Martin as their new head coach. And while this announcement has caught many off guard, it's no surprise to my top-secret DGB sources who tipped me off about it over the weekend. In fact, I was able to obtain a full recording of Martin's interview with Montreal GM Bob Gainey. I think this explosive transcript will shed a lot of light on how Martin managed to land one of the most coveted jobs in sports. Bob Gainey: Jacques, I want to thank you for coming in for this interview. Do you have any other commitments on your time today? As you can imagine, the interview process can be quite daunting for a job as prestigious as this one. Jacques Martin: No problem, I'm willing to spend all day here if I need to. Gainey: OK, great. First question: do you speak French? Gainey: You're hired. You nailed pretty much every qualification we have. Gainey: Is there a problem? Martin: I just thought we were going to spend some time talking about my experience. Gainey: Oh. Well, sure, I suppose we could do that. If you really want to. Martin: Well, my coaching career began with the Blues. Then I spent nine years as the coach of the Ottawa Senators. And for the past five years I've been with the Florida Panthers. Gainey: I don't remember you coaching the Blues. Gainey: OK, so let's skip that part and move on to Ottawa. Martin: Well, with the Senators I was best known for accomplishing something that virtually no other active NHL coach has managed to do. Martin: Losing to the Toronto Maple Leafs in the playoffs. Gainey (nodding): Yeah, I think we all saw that one coming. Martin: We lost to them four times, but the toughest one was in 2004. We made it to game seven, but then Patrick Lalime had an epic meltdown. We really believed that he was the guy who could backstop our team to a championship, but then he just imploded. Gainey: So you're saying you have experience dealing with over-hyped goalies who choke in the playoffs? Gainey: And what about your playoff experience since 2004? Martin: You heard the part where I said I worked for the Florida Panthers, right? Gainey: Sorry. My mistake. What about in St. Louis, what was your playoff record like there? Martin: No idea. Like I said, nobody remembers me coaching the Blues. Gainey: Fair enough. As you know, the media here in Montreal can be difficult. What sort of experience do you have dealing with the media? Martin: Well, in Ottawa they were very difficult to deal with. They were constantly asking me for autographs, bringing me coffee, or just offering me random hugs and back rubs. But they could be nasty, too. Sometimes, when we choked in the playoffs against a team we should have easily beaten, somebody would actually write a negative article. They'd always apologize the next day and print a retraction, but still, it was pretty rough. Gainey: And what about dealing with all the hockey media in Florida, was that difficult? Martin: So anyways, I'm sure I could handle the Montreal media. I have a well-tested strategy for working with the press. Martin: I'm so incredibly boring that they all quit after fifteen minutes of listening to me. Gainey: Well Jacques, I think you're our man. Do you have any questions for me? Martin: Just one: Any update on the ownership situation? Gainey: We're expecting an announcement soon, but I can't really say more than that. Gainey: You like Celine Dion music, right? I can never take Martin seriously as a coach. It's at least 80% because Quinn owned him when he was in Ottawa, but it's another 15%because he looks almost exactly like Steve Carrell, and 5% because I keep waiting for him to hire Dwight Schrute as an Assistant (To The) Head Coach. Clark is clearly a fan of the office. Money, DGB. Especially the quip about over-hyped goalies who choke in the playoffs. Can't believe they freakin' hired Martin. Martin is 0-5 lifetime against Toronto in the playoffs. Besides the 4 losses as Ottawa coach, he also lost to the Leafs in the '87 playoffs while he was coaching the Blues, despite sporting a pornstache at the time. His goalie was none other than Greg Millen. I wish I could laugh at this, but the main reason Jay Triano was given the full-time job to coach the Raptors was that he speaks 5 languages: English, Italian, Spanish, Croatian and "Jive". This is funny. Not as funny as the actual real life announcement that Jacques Martin has been hired as the Habs coach, mind you, but funny nonetheless. Looks like Martin rejoined the Northeast at the right time. He won't have to worry about seeing the Leafs in the playoffs for quite some time. All you leaf fans are the most conceited people ever, you guys never make the playoffs, and even when you do, you lose in the first round. The Habs are the better team, everbody knows this, people from toronto are afraid to admit it. Its quite obvious that your going to delete this comment to save face, but as yourself these two questions; when was the last time the leafs made it to the post season, and when was the last time they won the cup? The funny thing is that Martain's experience of losing to the Leafs in the playoffs goes all the way back to his days in St Louis.